I decided to tackle an Art Journal Adventure prompt in my art time. The prompt I chose from the ones I have skipped was the letter J combined with “something that shows half”. 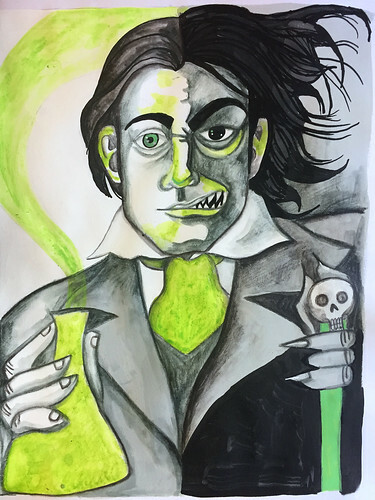 Frequent readers of my blog will know how my mind works and understand why I immediately settled upon illustrating Jekyll and Hyde. I interpreted “half” was being about duality but also chose to represent it literally by splitting my illustration in half and making one side more Jekyll and one side more Hyde. I think I just about got what was in my head onto paper. 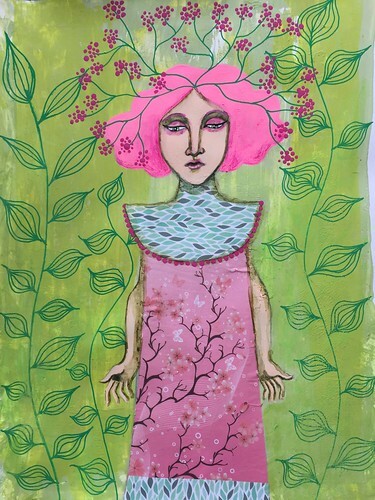 This was the second of the art journal pages I created while at my monthly art journaling group. I created it in response to two Art Journal Adventure prompts – bird and the letter I. I am being a bit cheeky with the letter I since I decided it is covered by my use of indigo. 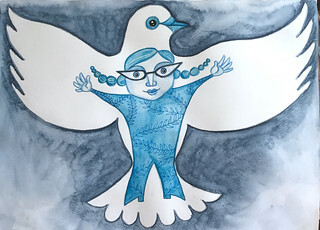 What inspired the illustration, however, was the song ‘Wings of a Dove’ by Madness. I have been on a bit of a musical nostalgia kick recently, introducing my sons to more of the music I was into when I was their ages and younger. For that reason, I had been listening to the track shortly before heading out to the meet up and, with the lyrics still in my mind’s ear, I decided to come up with an illustration. It’s drawn with Inktense pencils with a little bit of micron pen for the vine patterns on the clothing. I find my Inktense pencils are ideal for portable art because they can be easily activated with a water brush, are fixed when dry, and dry pretty quickly. 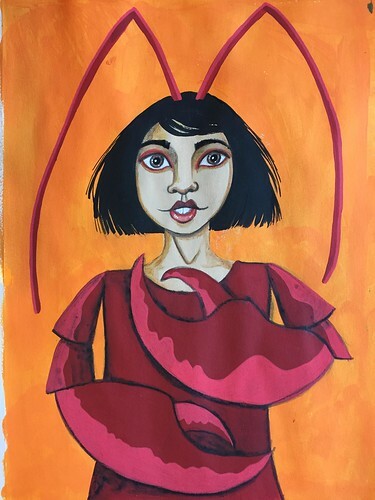 Maybe it was because I recently collaged a lobster into an art journal page or maybe it is my fondness for all things monstrous, but the next subject in my Rainbow Art Journal turned out to be a Lobster Girl. 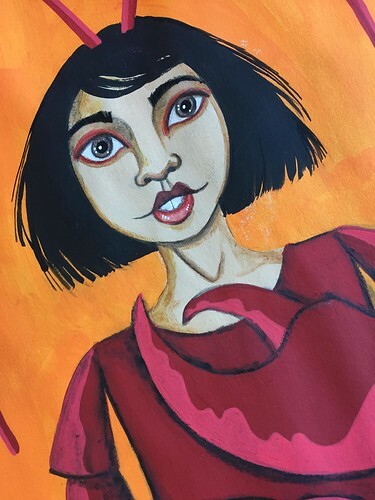 It’s the page where I am transitioning between red and orange so I guess that combination of colours sparked my imagination and set it off in that direction. Whatever the inspiration, when I put pencil to paper, this was the illustration that emerged. Someone asked me recently if I ever return to past works and have another stab at them in order to apply sharpened skills or a more developed style. 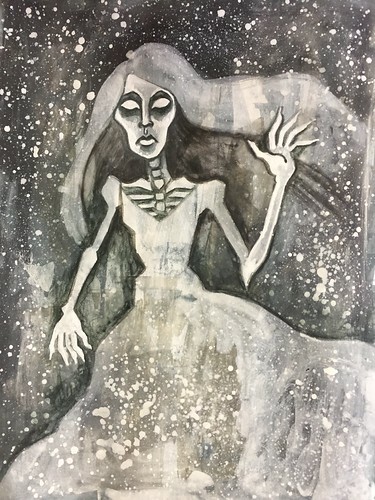 I do return time and again to certain subjects – zombies, Red Riding Hood, skeletal elements, mythology – but I don’t generally have another crack at a past artwork. 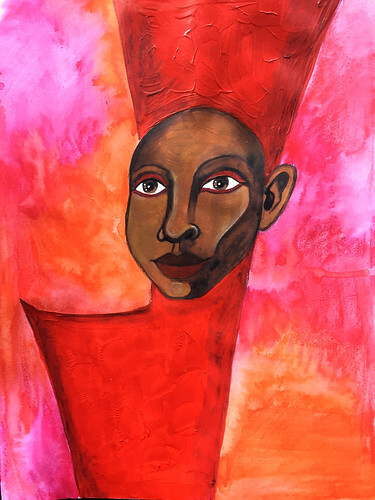 I thought, however, that maybe it could be an interesting exercise to take a few works in a medium I am more comfortable with -namely ink and watercolour – and try depicting the exact same subject using mixed media. I decided to use some of my illustrations from my 100 Faces challenge. First up for the experiment was my 85th drawing in the series, which I had titled “Confidence”. I chose it largely because I was working in the red section of my Rainbow Art Journal and I had remembered how much I liked the effect of the bold red ink pooling and puddling. I also chose it because it was an illustration I actually really liked in the series. I lost the more diagonal composition, which I definitely prefer, and I think the new version of the face looks more sullen and bored than confident. 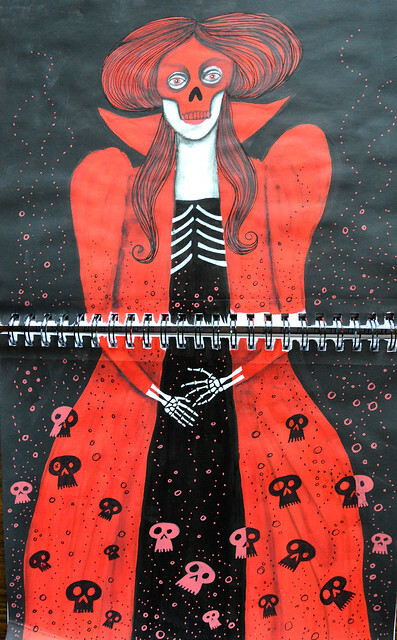 I am also not happy with that busy, blotchy background and may paint that out at some stage. However, as first experiments go, it is not such a failure that I will abandon the whole enterprise. Not just yet anyway. Since visiting two of Edgar Allan Poe’s former houses recently, I wanted to include something Poe-inspired in my Rainbow Art Journal. 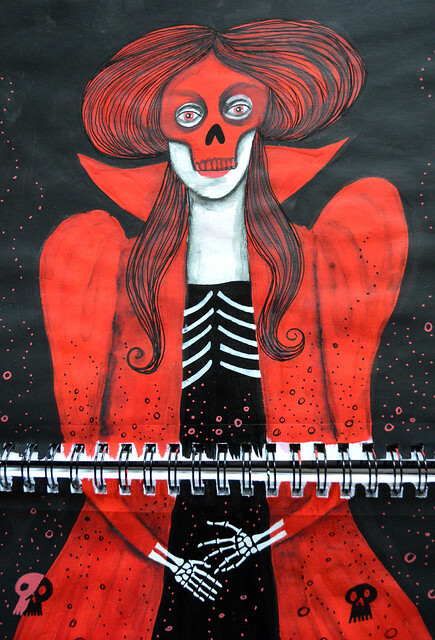 So, still focusing on the red section, I decided to create a page inspired by the story ‘The Masque of the Red Death’. I enjoy working with a limited colour palette and that was true of this page which is restricted to just red, black, and white. You may have noted that I also return fairly regularly to the subject of skulls and skeletons. I don’t think I am generally a macabre person; I just find that sort of thing fascinating. I am fairly pleased with how this page turned out. It was a struggle to maintain the proportions across the two pages and ultimately I failed to do so but I think the illustration still works. Just. I use spiral bound journals for convenience but they definitely hinder my ability with double page spreads, that’s for sure. Still, I like the finished pages enough that I may use them as inspiration for a proper painting at some stage.